Everyone knows chocolate and peanuts are magical together. 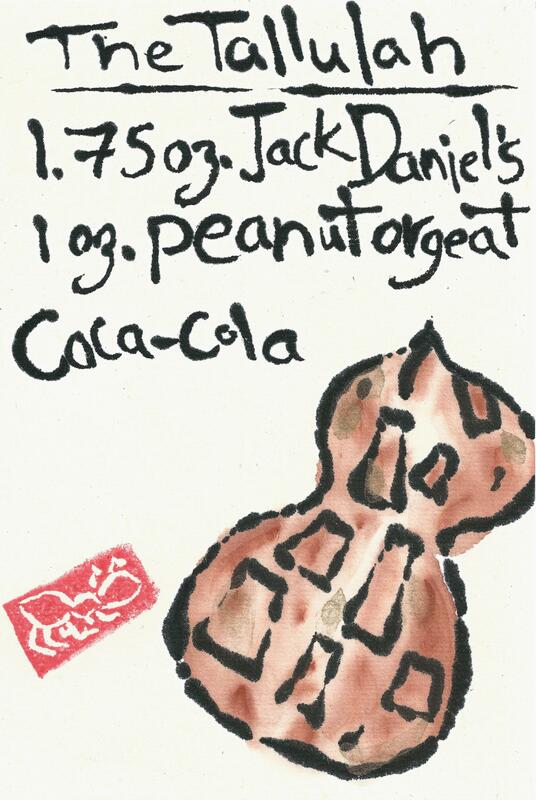 People in the US South think coke and peanuts are pretty special together too. This etegami is a cocktail recipe for the Tallulah, a cocktail mixing Coca-Cola, Jack Daniel’s, and peanut orgeat. The full recipe for both the Tallulah and peanut orgeat are here on Garden and Gun’s blog. The Tallulah is from Ollie Irene, a restaurant that looks like it’s worth seeking out if you’re ever in Birmingham, Alabama (it doesn’t look like they have the Tallulah on their current cocktail menu, but I think I could go for a Pickled Lime Rickey!). The peanut orgeat recipe is well worth the time investment to make it — all you need is 6 hours for the peanuts and sugar to steep, a cheesecloth (or, in my case, a fine sieve) to strain the orgeat through, and some orange blossom water (worth finding, I see it in my local Whole Foods and Harris Teeter) and brandy. I kept the peanuts from which the orgeat was made, thinking optimistically that I could somehow use them. Nope. Tasteless, dry, not worth taking up space in your fridge.